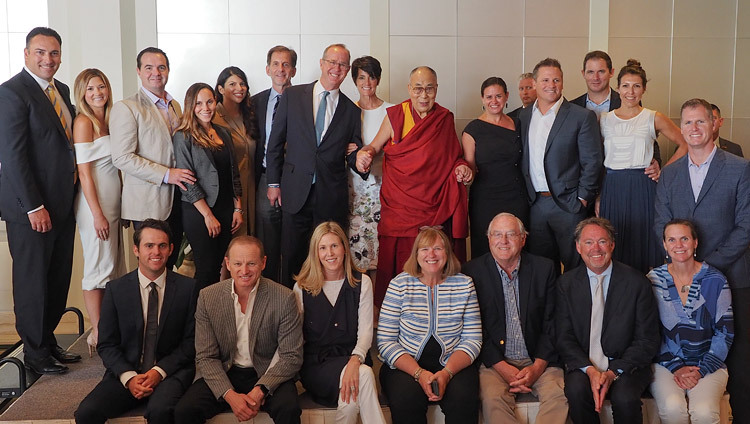 Newport Beach, CA, USA – After Tibetans and other well-wishers had gathered to see him off from San Diego this morning, His Holiness the Dalai Lama left early by road and made good time to Newport Beach. About 120 Tibetans, Vietnamese, Chinese and other friends, Anaheim Mayor Tom Tait principal among them, were on hand to welcome him. The Tibetans had prepared the ‘chema changpu’ traditional welcome, from which the guest takes a pinch of tsampa and grain and tosses it in the air making propitious wishes before dipping a finger into a cup of chang. His Holiness did this and guided Mayor Tait in how to do it too. Meeting with members of the local chapter of the Young Presidents’ Organization, a global network of young chief executives, His Holiness was introduced by his old friend Mayor Tait and began his address in his customary way. “I always start by addressing the people I’m talking to as brothers and sisters because I believe we 7 billion human beings are brothers and sisters. We are all born the same way and are raised in the warmth of our parents’ and particularly our mothers’ affection. Loving kindness doesn’t come about because of religion; scientists say that basic human nature is compassionate. This is a sign of hope, if we apply our marvellous intelligence and nurture it properly. “Sadly, today, our education system is focussed on external goals with insufficient attention to our inner world. This used to be taken care of by the church, but today schools need to provide such moral guidance. “I’m happy to have this opportunity to interact with you and grateful to my old friend Mayor Tom Tait for his introduction. I appreciate the way he has dedicated himself to fostering kindness in his city and would like to thank him and his wife. “I’d prefer to have some interaction with you, but first I’d like to outline some of my keen concerns. I am committed to the idea that if humanity is happy and content, everyone will be happy. We are social animals. Our survival depends on the community. These days we are part of a global economy. We face global problems like climate change that we have to co-ooperate and work together to deal with. Disagreements may arise now and then, but we can get over them. “When I was at the Mayo Clinic the other day, I noticed that patients are received just as people in need of treatment, with no questions about their background, nationality, race or faith. Most of our problems start from an over-emphasis on such secondary differences between us. The only remedy is to recall that fundamentally we are the same in simply being human. We need to stress the oneness of humanity. “All major religious traditions convey the same message of love, forgiveness and tolerance. They adopt different philosophical points of view, but their purpose is the same. They also adopt cultural aspects that reflect the different times, places and circumstances in which they arose. These include the Jewish adage, ‘an eye for an eye’, the Muslim formulation of Sharia law, the general custom of male dominance and in India the hierarchy and discrimination of the caste system. His Holiness explained his view that it’s wrong to speak of Buddhist or Muslim terrorists. He declared that a terrorist is a terrorist and as soon as people engage in such action they cease to be sincere Muslims or Buddhists. He cited a Time magazine cover depicting a ‘Buddhist Terrorist’ in Burma, but asserted that when that monk began to terrorize Muslims he was no longer behaving like a monk. Similarly, Muslim friends have told him that someone who initiates bloodshed is no longer a proper Muslim and that Muslims are exhorted to cherish all the creatures of Allah. Finally, His Holiness stated that as a Tibetan he is dedicated to raising awareness of the need to protect the ecology of the Tibetan plateau. As the source of Asia’s major rivers, more than one billion people depend on its water. He is also dedicated to keeping Tibetan culture alive, not in order to propagate Buddhism as such, but to share what is useful in its knowledge of the workings of the mind and emotions. What it can tell us about how to tackle our destructive emotions can be studied from an academic point of view. Corresponding to this is the need for a sense of secular ethics. Secular in the way it is understood in India, impartially respectful of all religions and even the views of those who have none. He said it is one thing to oppose religious institutions that have become corrupt, but who would oppose the basic religious doctrine of love and compassion? His Holiness explained that Tibet’s Buddhist traditions derive from those that flourished at India’s Nalanda University and are rooted in reason and logic, as well as the highly developed ancient Indian psychology. He stated that many scientists he’s met are eager to learn from it. He added that although the essential knowledge is contained in Buddhist texts, it can be studied in an academic way and with relevance to ordinary life. His Holiness answered an array of questions. They touched on the reception of refugees in Europe and his sense that they should be given shelter, support and training, but that the long term goal should be the restoration of peace and development in the countries they have fled. Asked what the biggest obstacle to compassion is, he replied, “A self-centred attitude and dividing others into ‘us’ and ‘them’.” He suggested that in democratic and interdependent 21st century it’s important to be more open and broad-minded. As to how leaders can have a positive impact he recommended that while the poor and needy must strengthen their self-confidence, those offering them help should do so with respect. In connection with his own leadership, His Holiness revealed that he preferred to consult a wide range of opinion from his tutors and staff to those of the humble sweepers. In addition, he revealed that faced with a dilemma he has recourse to divination and even examination of dreams. With respect to his retirement from political responsibility he made clear that it was consistent with an urge towards greater democracy that he has inspired him since childhood. And with respect to his reincarnation he recalled that as early as 1969 he had stated that the future of the institution of Dalai Lama would depend on the wishes of the Tibetan people. He joked that the Chinese government never misses an opportunity to criticise him, but pretends to an interest in how he will reincarnate. First, he said, they should make good on their faith and recognise reincarnations of Mao Zedong and Deng Xiaoping. Finally, a question about what he likes to eat led His Holiness to declare that, as a Sri Lankan monk explained to him, a Buddhist monk is neither vegetarian nor non-vegetarian, but content with whatever he receives. 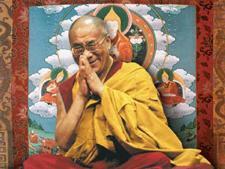 Nevertheless, he mentioned that he encourages vegetarianism in the main Tibetan monastic and school kitchens.